Red is the color of love, passion, and power. Not bad. As the color of love, passion and power, not to mention adrenaline and emergency, red is the strongest contender on the spectrum. In a visual arm wrestle, other colors don't stand a chance against red. 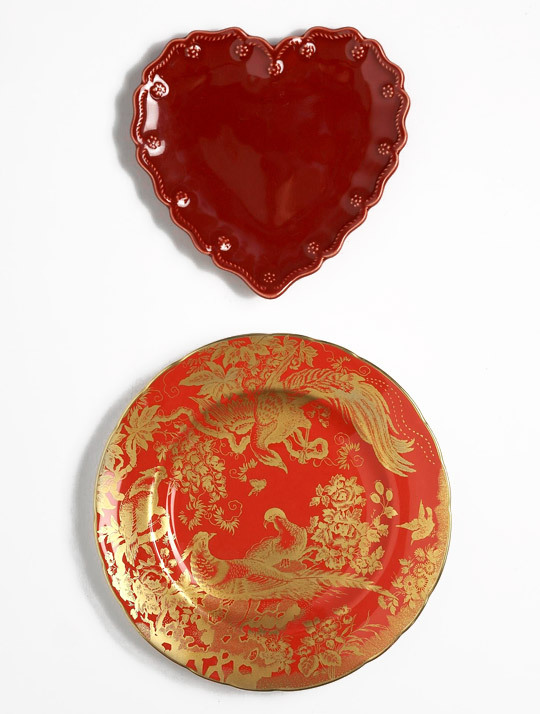 Studies show that red elevates our heart rate and gets our blood flowing. It does the same for creativity. No wonder designer Jennifer Flanders took it straight to the walls of her Upper East Side apartment when she transitioned into single-mom life with her two young daughters. Any fears she may have had about starting over? Jennifer painted her way around them! Red is the color of confidence. 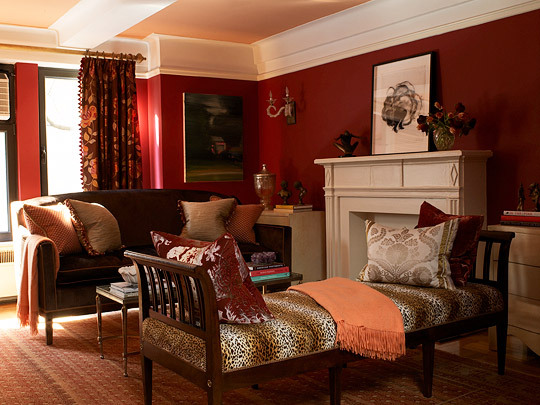 Jennifer's living room shows that one of the best ways to work with red walls is by weaving the color into the rest of the room. Too often, do-it-yourself designers become scared of overkill--once they've painted their walls red, they back off of all color entirely. But as this space proves, integrating the wall color into other areas of the design--repeating it on decorative pillows, and in milder tones on the rug--actually reduces the chance of making too bold an impact. It may sound counter-intuitive but it's true: repeat the reds, and introduce additional colors, such as brown and orange, for a full-bodied effect without a trace of harshness. 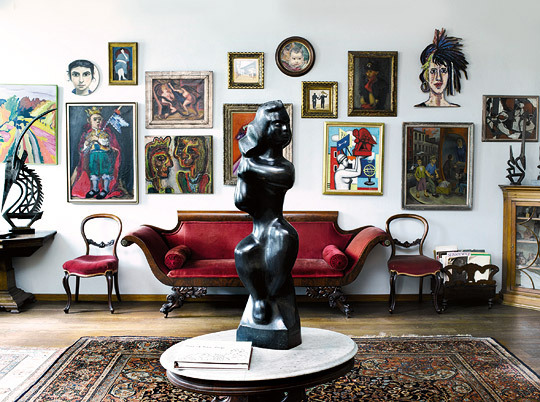 When art's the most important design element, as in this loft apartment-turned-museum in Greenwich Village, the walls stay gallery-white while punches of red on the upholstery prevent the furniture from disappearing. 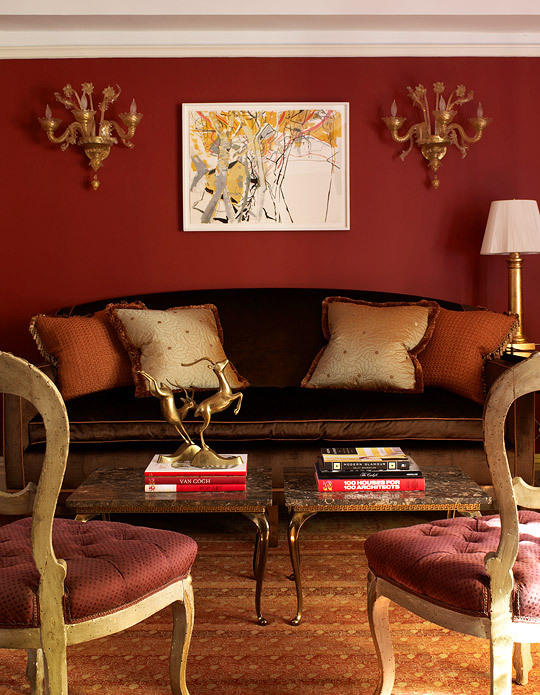 The bold red furniture fabrics, along with the reds in the antique Oriental rug, also pick up the reds in the paintings, pulling the art into the room's cohesive design. 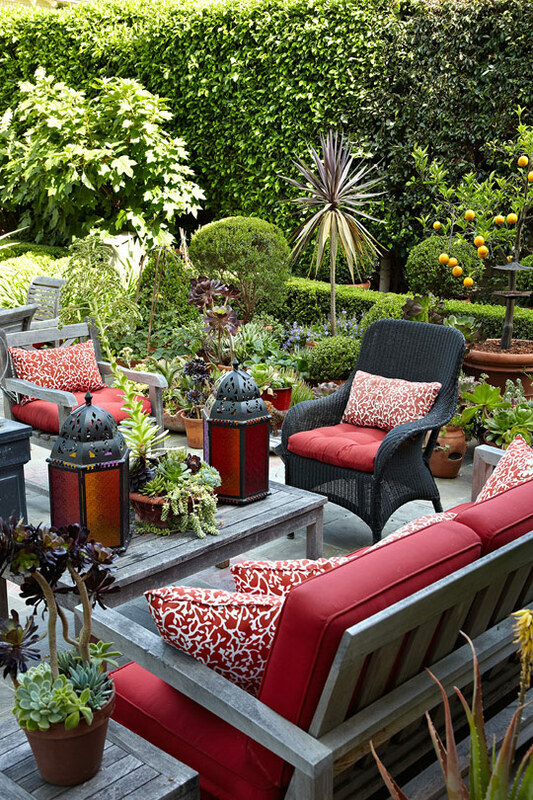 A little or a lot--that is the question when decorating with red. 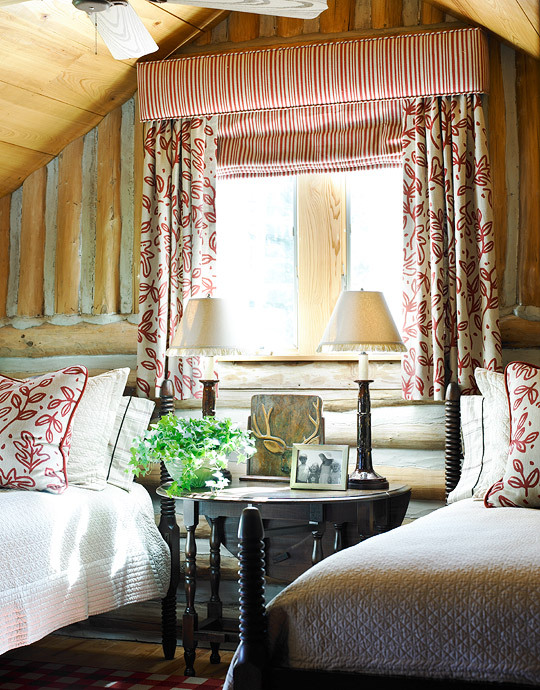 In Gail and Roddy White's Appalachian log cabin, the answer was both--a little red on a lot of textiles. Atlanta designer Carole Weaks decorated this loft bedroom with a cozy red-and-white-checked rug, and window treatments and pillows that sport graphic red prints on white grounds. The creamy-white mattelasé bedding provides a clean backdrop that allows the three red patterns to pop. Ask any 10 designers how they begin a room's palette, nine of them will tell you it's with a rug. That was the case for Anna and Alan Clark in their Hancock Park home in Los Angeles. 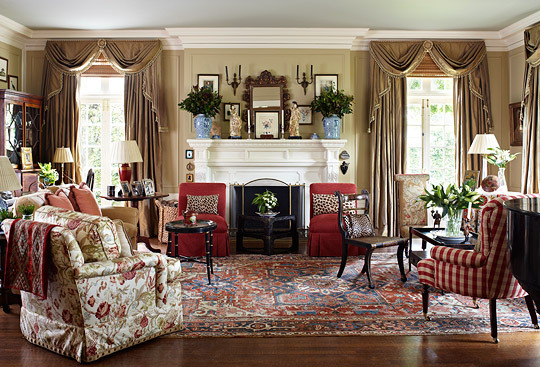 Rich red in the living room's antique Serapi rug was plucked as the dominant color for the room's palette. Cowtan & Tout's red-and-white plaid fabric on a Lee Jofa armchair ups the energy with its playful geometry. 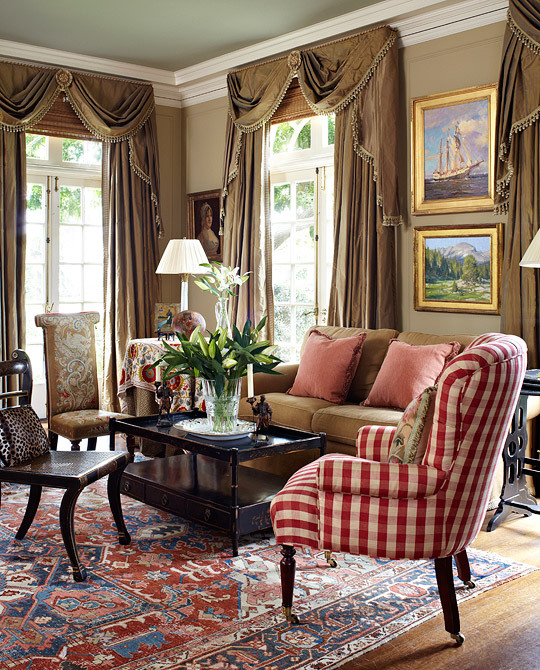 With such a vocal red pattern on the floor, Anna wisely made windows and walls quiet in two tones of taupe. But look at the fireplace. The pair of vibrant red slipper chairs pulled up to the white fireplace make the room pop, leaving no doubt that red is the main player in this space's palette. And take a look at the cushy club chair in the foreground on the left: The Colefax and Fowler chintz that's covering it replays the red theme, this time in a minor key, with lots of snowy white ground to chill the red's fire. See what happens when red is presented against yellow walls? 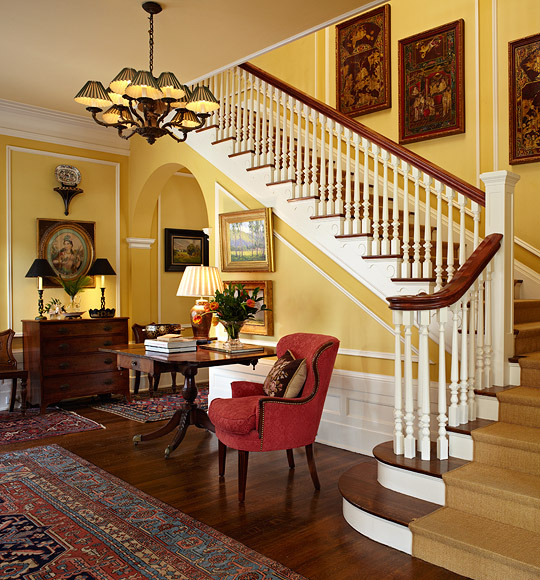 Both red and yellow are warm colors, and this staircase view fairly sizzles with welcoming heat. Now see what happens when a third color--this time a cool one--is added to the red/yellow combo. The addition of green makes all the difference in this family room's temperature. 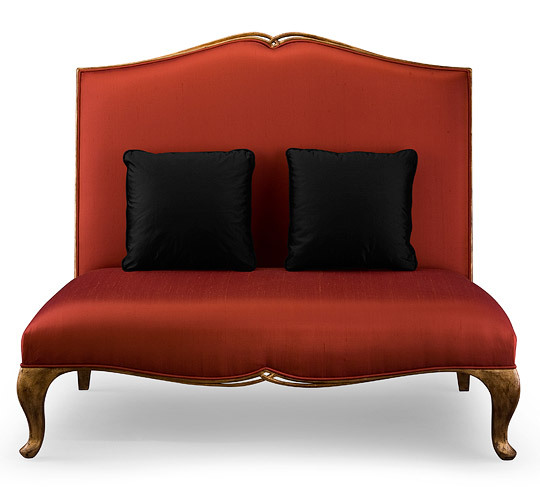 Red still figures prominently in the palette as the sofa fabric. And it reappears in the fresh floral chintz dressing the club chairs, but only in a supporting role. 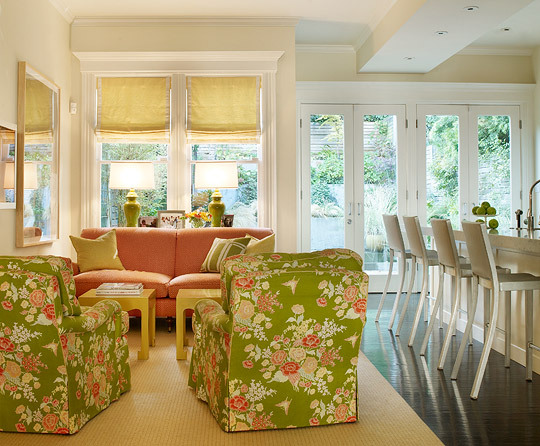 Lime green, as the floral's ground, really is the room's main color statement. Yet the room still doesn't feel exactly cool. So what prevents a design with so much green from slipping into somnolence? The piquant wake-up call of red.